Just like in 2017 and 2018 I have been named a Nutanix Technology Champion for 2019. While I haven’t been involved with the tech as much as in 2017 at least I tried to keep up to speed in 2018 by playing with the community Edition. Besides that I started two things on the Nutanix front in 2018: getting an NPX bootcamp to The Netherlands which I attended in September and trying to start a Nutanix User Group in The Netherlands and that will have it’s first meeting the 1st quarter of 2019! Besides that I attended the Nutanix .Next on tour event in Utrecht and of course .Next EU 2019 in London. 2018 has been awesome but I am 100% sure that 2019 will be even better! please remember this is article is written while I was still waking and sobering up from last nights party at The Tobacco Dock. The last couple of days where a blast. I came in on the Eurostar on Tuesday and while others had issues with flights being cancelled I had no issues crossing The Channel by train. At 3 PM we started the rehearsals for Wednesdays opening act where we had to juggle a bit with balls. We where being trained by 4 pro’s including brand new World Champion Aguska Mnich that showed how things are done on stage. Too bad they didn’t have a lot of time on stage because backstage they where showing some amazing tricks. After this I finished the evening meeting some great community people at the Welcome reception and a dinner with some Dutch Nutanix employees and customers. Wednesday started at 7.30 am with the last rehearsals for our opening act. It was great fun doing this though the stage was even warmer than the keynote room (usually keynote rooms are cold due to their size, over calling it warm was an understatement). When the keynote ended I went out to Angelo’s awesome community lounge before we went out to the NTC lunch where it was great meeting all the other ntc’s. It was quite a big group this time compared to last year. In the afternoon I visited my first breakout about Nutanix files and it’s awesome to see how this product has grown over the years. It’s a full-fledged nas replacement now that’s just as easy to scale out as a Nutanix cluster with the same performance. closing keynote was by Bear Grylls. I expected a bit more energetic person on stage but in fast he even looked a bit shy at some points. His main point: never give up! This years party had an old style circus theme at the Tobacco Dock and while some of the music and smells where a total sensory overload for me I ended up in the saloon enjoying the (mostly) acoustic music. While I already finished my first blogpost of the year I decided it was time for me to write another one. The kind that I usually avoid like a plague to write: a post looking back at 2017 and forward to 2018. For me these kinds of posts are on the same level as stupid lists: I frigging always hated creating and evaded them! Essentially though my monthly flings posts are lists so why wouldn’t I write a the looking back & forward posts as well? This mentality is exactly something what I started doing in 2016 and certainly continued in 2017: challenging myself to new things. The presenting bit I had already introduced myself to in 2016 but last year I also did my first presentation at a VMUG not in my own country but I travelled to Germany for their UserCon to present three of my favorite VMware flings. After the short vBrownbag at VMworld US in 2016 this was only my second time presenting in English. It also was my first time to exactly hit the spot timewise in the 30-minute timeslot I had. Luckily the base for the presentation was good since I had done it at the Dutch VMUG UserCon (sorry it’s in Dutch) a couple of months earlier together with my good friend Hans Kraaijeveld. I had ten extra minutes though so instead of showing the slide deck I decided to show the tools instead of boring screenshots. Next time I just need to improve on some things and make a script on beforehand (thank you Johan for the Feedback) on what to do, but since I decided to change this the evening before in my hotel room preparation was suboptimal. Besides the vmug’s I also managed to find me a spot on the vBrownbag schedule for VMworld Europe. I can’t really say that my presentation was a success, I was tired and just didn’t get into the proper flow for it. I did pick up some extra essential experience doing it though. Beside my own presentation I also had lots of fun on the vExpert daily broadcast. In 2017, I have started being more active on Reddit & VMTN. Specially reddit can be a flamewar every now and then but there are very decent topics and replies as well. On vmtn it’s really hit and miss about quality, some are decent posts but lots also prove that the ts (topicstarter) totally didn’t do their homework or have had any experience with the product they are trying to use. The most fun community wise I had at the VMware Code Hackathon at VMworld EU. While our project didn’t go smoothly we had lots of fun and everyone learned at least a couple of things. Next time I will just make sure we have our own infrastructure available to us. And those hippie shirts simply rule. VMworld itself was an awesome community event for me as well. While I still visited some sessions the hanging around with other vExperts and bloggers made it again an awesome event for me. At the beginning of November, I also visited the Nutanix .Next event and while there where less people over there that I knew I made some friends right away (or not Dugi?) and kept having fun with those selfies after I got some comments on looking grumpy at the first one. It was also good to finally meet some of the other NTC’s. 2017 was a year with lots of awesome events for me. I visited not only the Dutch and German VMUG but also managed to squeeze the Belgium VMUG in my schedule was well. Then again VMworld EU and Nutanix .Next and in December I also visited the inaugural Dutch vEUC Techcon that had lots of great content. In the learning zone, I managed more then I planned for in the beginning of 2017. I had agreed with my manager that it would be a quiet year for me an oh boy I did not keep myself to that agreement. First, there was the Certification ME work I did and got the certifications for: vcp-dcv 6.5, vcap7-dtm design and the vca-dbt exam. Ok this is not learning and doing the exam but by creating and checking the questions one can learn just as much in my opinion. I did two actual exams in 2017: vcp7-dtm and vcap6-dtm deploy. The first one I passed and the 2nd one I sadly failed on, since it was my first vcap deploy I didn’t expect anything else and overall it was a good experience in preparing for the next one. Something certainly needed is an HD monitor and proper amounts of coffee in advance because the you need to stay sharp and time will be an issue. Again, I learned a lot by working at these projects but they are very time intensive so I don’t know how eager I would be for coming projects. So, what am I expecting for 2018 personally? Hopefully I will be allowed again to speak at the Dutch VMUG Usercon, I proposed one personal session in the CfP and one session together with Hans Kraaijeveld. Also, I would love to extend my personal session and build it out to a VMworld quality and be able to deliver it there as well. Besides VMworld I would like to visit the BE vmug and Nutanix .Next also again this year. In the community, I want to keep at least as active since my Nutanix NTC is already extended to 2018 and hopefully I will also receive vExpert again in 2018. The vExpert & NutanixNTC slack channels simply rock. Both have awesome vibes with lots of people always eager to help you with any questions you ask. I only have one real learning goal so far for 2018 and that is to pass the vcap7-dtm deploy exam. Sadly, it hasn’t been released yet but that doesn’t say I can’t prepare for it either. My ultimate goal would be to become vcdx but that’s something I will only start working on this year, don’t expect me to submit soon. As something for fun, I might try my hands on the nsx certifications even though I am not a networking person or maybe something from Amazon since a lot of VMware admins seem to be heading that way as well. For the rest, I have only this to add: Happy New Year and have an awesome 2018! Last week as you’ll probably already have seen I was at the Nutanix .Next 2017 Europe event in Nice, France. During this amazing event, I visited several sessions going from sales talks, via an NDA session to a deep dive. In this post, I will try to give a bit more information about the sessions I followed as far as I can do. Disclaimer: this overview is based on notes written during the session and my memory and since specially the latter is not failsafe they could be some untrue things in this post. Please send the feedback directly to me so I can adjust them. Also, I don’t have equal amounts of text about all sessions because nothing is equal. Nice disclaimer, right? This was just if the disclaimer all presenters had to read before starting their sessions. On screen, there was an even bigger one equally to the one showed during the keynote’s. While this clearly is a sponsored session only the middle part was commercial. Before and after that it was about those six rules and what they are according to them. I will give a bit more explanation about them that also might include my own opinion about them. It is, just think of your smartphone, Google home, an Echo dot or maybe your home thermostat. Everything has an interface these days. While voice commands where hard years back it has become really mature these days on some of those devices. If something doesn’t work flawlessly users will not accept it and the product will fail. Same with doing business, if it gets hard for a customer to do business with you they will go away and take their business somewhere else. With this they say that we should prepare for more and more data. Everything will have a sensor in the future, from the floor you walk on, trough the shoes you walk with up to the hat you have on your head. This will need to be handled somewhere. With this they try to say we shouldn’t keep thinking the same way. Change needs and will happen and if you refuse to change you will lose. If you are not honest this will haunt you. In a world where a single tweet can bring down companies being dishonest might result in that tweet. If you don’t keep pioneering and developing yourself there is no way forward. If companies keep doing the same repeatedly they will fail in the end. Same with people, if I never learned anything new or would never think outside of the box I would have been unemployed for years already. This was a fun session to follow and while the 6 points ‘coincidentally’ are generally the direction Nutanix is going they are also what lots of people see happening in the (near) future. This session was meant to be presented by Brian Suhr but he managed to brake his leg the week before so he was replaced by Kees Baggerman of Nutanix and VCDX-DTM Sean Massey. I had to sit in front because I big mouthed Angelo Luciano to sit up front and Sean made me take his place. Me always with my big mouth. While a lot of the content in this session was already known to me it was good to see some of my knowledge once more confirmed and they presented us with some figures I would never have guessed. I always knew that optimizing an image is required but up to 50% performance was new to me. Also, they gave numbers to prove that data locality is essential for VDI. I can’t remember the exact numbers but there was a big difference with or without shadow clones enabled. This was a very good session that showed the audience on how to design a good working VMware View environment on Nutanix. Since this was an NDA session there’s not a lot I can say besides that it contained presentations about ideas and product improvements that came out of the Nutanix Internal Hackathons. Only point I have about this session that it contained code samples that where hard to read since the text was too small. To start this session had some hard to read blue titles in the PowerPoint and too small text size ssh session screens. Content wise this session was about the tools you can use to manage and troubleshoot your Nutanix Environment like the alerting services, NCC, syslog, Pulse and Prism analysis. Further it went deeper into the thought process and framework required for successful troubleshooting. Some of the key takeaways from this session where that an admin should always run NCC before logging a case. Also, Pulse should be enabled where possible and allowed. This sends only relevant information to Nutanix that contains no IP or data. This was a great session with heaps of technical information. Again, this was a good session to follow. Some of it might have been lost on me but Calm looks to be an awesome and easy tool to use. The real nerds will be able to dig deep into it though and can connect it to any automation tool already in use and can even create the json config files automatically using other tooling. Calm itself consists of two docker systems running on Prism Central, by default it will be disabled but once enabled (and maybe the ram for the Prism Central server(s) is expanded it will give access to just about anything you want to automate ranging from PowerShell to SSH, batch or the programming language you might prefer. Disclaimer: this post was written between 6 am and 7 am without having access to coffee. So, that was the second and last day of .Next Europe 2017. The rush from day one continued with a great keynote where Nutanix launched their vision on how to handle IoT. The keynote itself started with the outtakes of yesterday’s clapping video which was funny and had a lot of beeps because of all the profanity. Back to the IoT, within no-time there will be three billion devices but probably more that need to send their data somewhere. This will be way too much to send to the cloud. Nutanix will process this data in the edge and only send the valuable stuff to the cloud. For this even container are too big and even smaller entities will be handling that data. Sherlock is what Nutanix named this functionality and it will handle IoT devices as first-class objects and we will literally go from webscale to planet scale computing. After this the CEO of Hyperloop came on stage to talk about the progress they have been making. Personally, I really see a future for this tech but I doubt if it can be done as cheap and as safe as what he is saying. The keynote needed with a tale about machine learning with a comparison of Big Blue beating the best chess player in the world years back by brute force to the best Go player in the world being beaten by using machine learning. The second day of .Next I only did two break-out sessions. The first one was about troubleshooting and the tools and thought paths needed for that. The second one was a deep dive on Calm where we were shown all the bells and whistles wat can be really done with Nutanix’ new automation tool. I ended up in a 3rd session but it started with five minutes of sales crap so I was happy to escape so I could record a podcast with Sean Massey about Horizon View & PowerCLI. The closing keynote was just awesome. There was some other thing being told but it was all about one of the good causes that Nutanix has been sponsoring during the .Next conference: Not Impossible. This is all about helping people and all started with CEO Mike Ebeling telling the family of a graffiti artist that he would make him able to draw again. Having no idea on how to tackle this he gathered a bunch of mad scientists and ended up doing it with cheap hardware and open source software; The Eyewriter. Their second project was project Daniel where he decided to create a cheap way to make artificial limps for a victim of the fighting in Sudan that had both his arms amputated. He developed techniques so the people in the refugee camps would be able to help each other with cheap 3d printers so artificial limbs went from 1000’s of dollars to 100’s of dollars. To repeat an earlier phrase: ooooh what a rush. Yesterday was a great day in a perfectly named Acropolis where Nutanix is holding its second .Next Europe. Being one of the 2200 attendants in an atmosphere that really feels vibrant is awesome. Due to security and busses leaving late from hotels the Keynote (with my mugshot in there since I am a Nutanix Technology Champion) began 15 minutes late but made up that lost time by ending 45 minutes late. The only other point about the keynote was that it went a lightning speed. As techs, we managed to follow everything but I am 100% sure that a lot of people didn’t manage that. In here we saw some new features of the 5.5 release, new tools and performance charts that are just unbelievable. The fact that they did demos on stage made it even better. The key thing from the keynote for me is that everything will be about simplicity. If apps/tools can’t be consumed very easily they will never be as successful as apps that are and the mantra of More Tea Less Clicks will probably appeal to everyone although some people might name it More Life Less Clicks or More Beers Less clicks. Due to the keynote running late I missed my first session about xtract since I really wanted to visit with my fellow NTC’s at our lunch. It was good to finally meet the people behind the names with Sudheesh Nair making a surprise visit. He was almost literally pulled from the hallway by Angelo Luciano when he walked by. My first session was from Dell about the six rules of disruption. This session told an obvious story with a little bit of product marketing in between. Nothing too much but hey a vendor has to sell so things, right? The second session I did was a Horizon View on Nutanix session. This was supposed to be done by Brian Suhr but he broke his leg last week so Sean Massey (VCDX-DTM) and Kees Baggeman had to replace him. They had some good takeaways and performance tips and tricks for the audience. Both sessions will be covered more extensively in a later post. I will not be able to do that with my last sessions since this was an NDA session with new tools and features that might or might not end up in final products presented by the engineers who created them at one of the Nutanix Hackathons. The evening keynote started with a small fireside chat about politics and economics and how they influence each other. After this Fabian Cousteau came on stage for a very inspiring talk about the sea and how it impacts everything on our world. He had a very good tale and awesome videos to show. I visited the reception at the convention floor for a short while but did not go to the party. I was getting tired and since I am not really a party person I probably would have left early anyway. I saw some pictures that they had a big tent at the beach and that was food since there was a good thunderstorm when I left the venue. 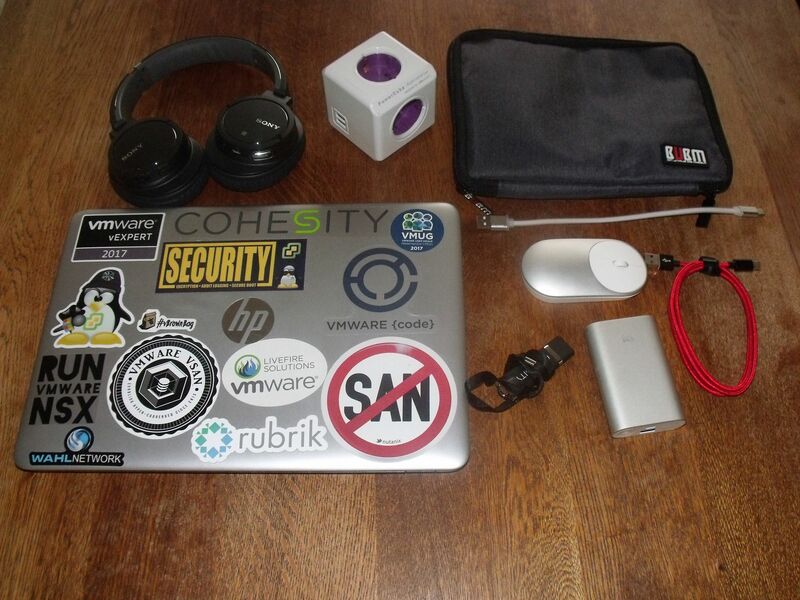 So previous to VMworld and also for MS Ignite I saw some people posting pictures of what would be in their bag for those events. Since I have always been a bad copycat I decided to make a post like that myself for Nutanix .Next Europe that I will be attending. Since it’s still some weeks to go the list might change a bit but this is the core of what i will be bringing. My day to day laptop is an HP Probook 440 G4 it by defaults comes with an 128GB NVME and has an extra 500Gb SSD added to it with 16Gb of ram. This is plenty for me and when I want I am always able to run a couple of VM’s. It has an USB-C port but sadly HP made sure it can’t be charged over that 🙁 It does have a regular USB port that gives some more power to charge my phone. When doing simple office work it has a battery life of about 6-7 hours so for most convention days I only need to charge it overnight. With 14 inch it has a nice size and the weight is also low enough. this smart talky talky thing is a Samsung A5 2017 and yes the screencover needs to be replaced. Again it goes a very long time on the battery, only when i get distracted by Boom Beach it goes down a lot faster. From my employer I have a Samsung S4 mini, this makes phone calls, does whatsapp and the mail and that’s about it. To keep the rotten sounds out and the good sounds in my ear I use the Sony MDR-ZX770BN. Since in ear buds always give my headaches I went with this over ear set that i got recommended by a lot of folks in the community and I love it. it gives a lot of bang for the noise cancelling buck. For the rest I have a supposedly (but who believes China?) Bubm DIS-L case fits all those goodies that normally would get lost in my backpack. It will be holding a battery pack (Xiaomi 10k for when i have played to much Boom Beach), Xiaomi Bluetooth mouse (Cheap, works perfect), USB stick, charging cables and whatever else I can think off. Xiaomi does have some good and cheap things to use it just takes a while before they arrive from China. Wait, a travel adapter? You’re form The Netherlands just use your normal plugs! Yes I will be using those but this is an ideal travel adapter. The Powercube Rewireable USB isn’t a normal adapter. This cube uses a normal C14 cable or one of the plugs that come with it for other countries. So for France a normal power cable is all it takes to give me four power outlets + two 2A USB ports. Ideal for when you are travelling.